The Thick-billed Murre is very similar to the Common Murre (Uria aalge), and both species may sometimes hybridize as they can be found together in many areas, and even nesting on the same ledges on rocky islands throughout their circumpolar range. This species favours the very cold waters and swims far better than it flies. Like most Alcidae, it literally “flies” underwater, propelled by its stubby wings, and it usually reaches depths of more than 100 metres while pursuing preys. The Thick-billed Murre is vulnerable to oil spills, fishing nets and seasonal hunting in Canada and during their migration. But currently, the population appears fairly stable. 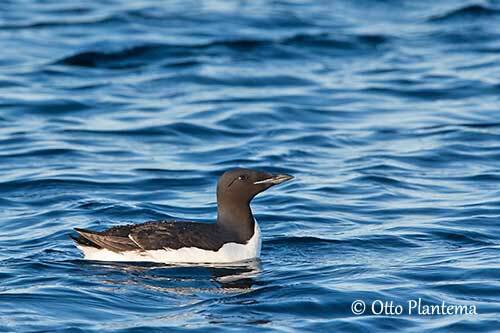 The Thick-billed Murre has slightly bulkier appearance overall, and thicker and stubbier bill than the Common Murre. The adult has black head, neck, back, wings and small rounded tail, whereas underparts are white, including the underwing-coverts. On the upperwing, the white-tipped secondaries form a narrow white wingbar on closed wings. In flight, they form a partial white trailing edge. The heavy bill shows strongly decurved culmen, and we can see a white stripe towards the base, along the cutting edge of the upper mandible. The eyes are dark brown. Legs and webbed feet are greyish-black, tinged yellow beneath. Male and female have similar plumage, but the male is slightly larger. The adult in winter has white chin and throat, involving almost capped appearance. The juvenile resembles adult in winter, but it is smaller, with slightly darker chin, throat and underparts. 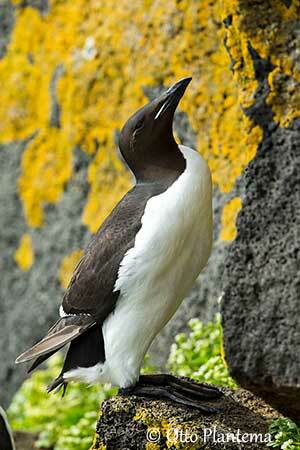 The Thick-billed Murre has 4 subspecies. U.l. lomvia breeds in NE Canada and Greenland, E to Franz Josef Land and Novaya Zemlya. U.l. eleonorae breeds in E Taymyr Peninsula, E to New Siberian Islands. U.l. heckeri breeds on Wrangel I, Herald I and N Chukotskiy Peninsula. U.l. arra breeds in N pacific from NW and SE Alaska, and Aleutians to Sakhalin. 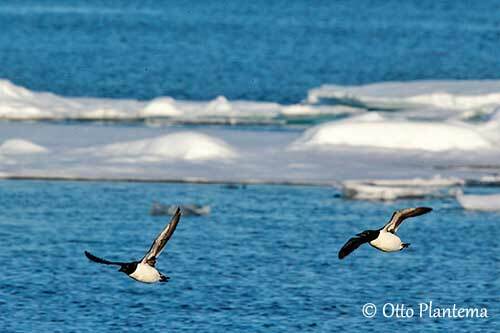 They winter offshore along the sea coasts, usually in low-Arctic waters. Some may winter in the northern part of the boreal zone, S to Gulf of Maine, North Sea, Sea of Japan and Gulf of Alaska. The subspecies differ in length of wings and tarsus, and bill size too, usually larger in the eastern part of the breeding range. The Pacific subspecies U.l. arra is darker and larger. 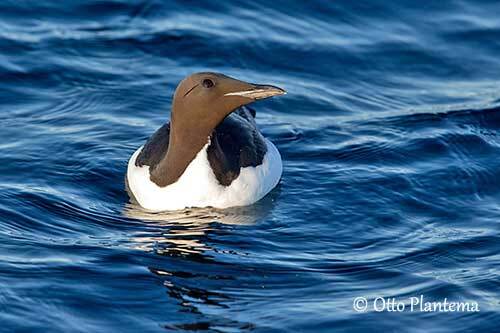 The Thick-billed Murre occurs in and around Arctic waters. It breeds off the rocky coasts of Alaska, Greenland, Scandinavia and Russia. The colonies are established on narrow ledges on sea cliffs or on rocky islands. Outside the breeding season, it is at sea, sometimes at edges or openings in pack ice, offshore to the edge of the continental shelf. It can be seen along sea coasts and in bays where it finds abundant food sources. 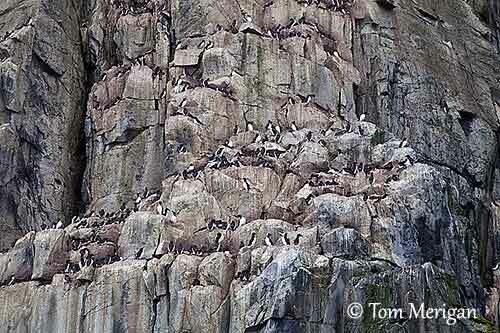 They form large flocks at sea, especially around prey concentrations. The Thick-billed Murre’s voice is similar to that of Common Murre. It utters a low, purring “murrr”. On the breeding grounds, they produce a variety of croaks, growls and guttural calls. 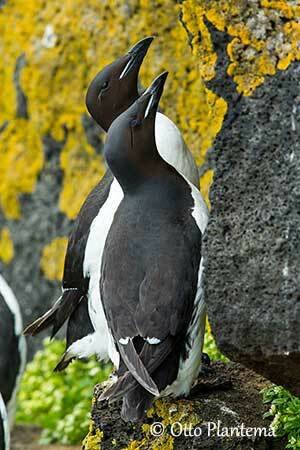 The Thick-billed Murre feeds primarily on fish in summer, and the chicks are almost exclusively fed with fish. It catches several species of fish including cod, herring, capelin, sand lance, sculpin and several others. During winter, the diet includes more crustaceans such as shrimps, amphipods and copepods. It also takes marine worms. However, fish, squid and crustaceans are taken all year round, with polychaetes and molluscs. The Thick-billed Murre forages by swimming underwater. It dives to depths varying from 10-30 metres to 50-70 metres, and to 100 metres or more occasionally, while pursuing a prey. It also feeds on benthic fish regularly taken from the sea floor. It can remain underwater for more than 3 minutes. Like other Alcidae, the Thick-billed Murre is well-adapted to its marine life, thanks to many morphological and anatomical characteristics allowing the bird to dive and propel itself underwater with its short, strong wings. Both bones and muscles facilitate body movement underwater and reduce buoyancy when diving. 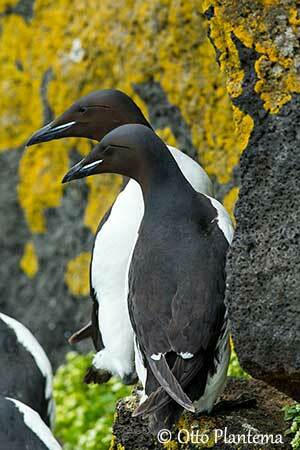 The Thick-billed Murre is gregarious and breeds in huge colonies and at high densities on sea cliffs. They perform communal displays at the beginning of the breeding season. Pair formation may occur before the arrival at the colonies. Both mates perform some ritual displays at the nest-site, bowing and nibbling at each other’s bill. They also pick up pebbles and present them to each other. Copulation takes place at or near the breeding site in the open. They are monogamous. The Thick-billed Murre winters offshore at sea, and the dispersal depends largely on ice conditions and food availability. They usually winter wherever there is open water. They return to the breeding grounds in March, and most birds are back at colonies between mid-April and late May, sometimes later according to the sea ice break-up. Murres often perform a “wheeling” flight, a defensive flight pattern to keep them safe from Bald Eagles and Peregrine Falcons. The Thick-billed Murre flies better underwater than through the air, because its narrow wings provide it little lift for the take-off. However, it flies rapidly once in the air, up to 75 km/hour. It flies low over water on short whirring wings. The large webbed feet are used as rudders. It often makes several attempts to land on the narrow cliff ledges. The laying is usually related to sea temperatures, and it occurs later where temperatures are very low. It often takes place in late June/early July. 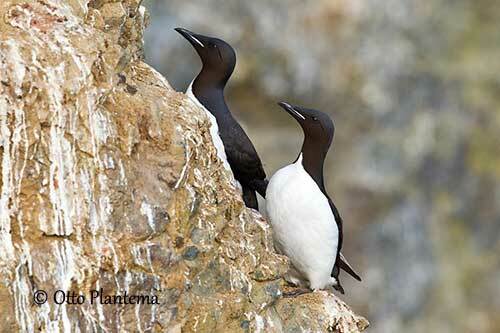 The Thick-billed Murre nests on steep cliff faces on narrow ledges. The breeding site is defended by both mates by threat displays and fighting. In such high densities, aggressive encounters are frequents but of short duration, due to highly developed appeasement displays and signals. This species does not build a nest. The female lays a single egg on bare rock. This egg is pyriform, in order to avoid falling off the cliff. If it is bumped, it only rolls around in a circle. The colour varies from green to pinkish, helping parents to recognize their egg as they nest shoulder to shoulder, with densities of 10-30 eggs per square metre. Both parents share the incubation during 32-33 days, with stints of 12-24 hours. At hatching, the downy chick is blackish-brown above and white below, while the head is streaked white. Both parents brood, guard and feed the chick during 3 weeks, until it fledges. When the young leaves the nesting-ledge, it is accompanied by its father. It still depends on adults for at least 4 weeks, but probably more, up to 8-12 weeks. If an early egg loss occurs, often by falling off ledge during change-overs, a replacement clutch may occur after 11-17 days. The Thick-billed Murre is vulnerable to human disturbance involving egg loss, but they also suffer from storms, cold weather and introduced predators such as both Arctic and red foxes. At breeding colonies, the birds are sensitive to helicopters and disturbance from above them. In Alaska, both adults and eggs are collected by hunters. Hunting pressure in other parts of the range caused population declines in the 20th century. 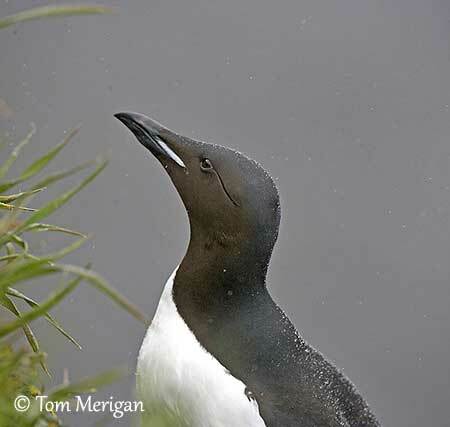 The Thick-billed Murre is vulnerable to oil spills at sea, and drowning in fishing nets is another cause of mortality. The global population is estimated to number 22,000,000 individuals, and the population trend is increasing in North America. However, as the breeding ranges of the Thick-billed Murre and the Common Murre overlap extensively, it is difficult to identify every individual. 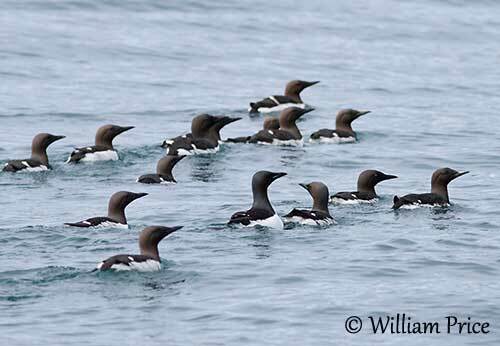 The Thick-billed Murre is currently evaluated as Least Concern.